Review by AllTheBestFights.com: 2017-07-15, one round to warm up and then the war exploded: Omar Figueroa Jr vs Robert Guerrero is one of the best boxing fights of 2017 and it gets four stars! The undefeated former Wbc Lw champion Omar Figueroa Jr entered this fight with a pro boxing record of 26-0-1 (18 knockouts) but he is not ranked as he hasn’t fought since December 12, 2015 when he defeated Antonio DeMarco (=Figueroa vs DeMarco); before this bout he had won over Ricky Burns (=Figueroa vs Burns). His opponent, the former world champion in four different weight classes Robert Guerrero, has a record of 33-5-1 (18 knockouts) and he entered as the No.22 welterweight in the world but ‘The Ghost’ won just one out of his last four bouts, against Aaron Martinez (=Guerrero vs Martinez). 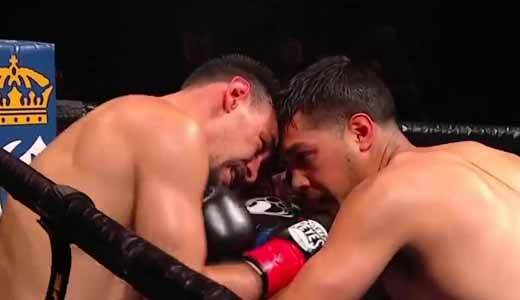 After this fight he has lost to Danny Garcia (=Garcia vs Guerrero) and David Emanuel Peralta (=Guerrero vs Peralta). Omar Figueroa Jr vs Robert Guerrero is the main event of the evening. Watch the video and rate this fight! Review by AllTheBestFights.com: 2016-08-27, pretty good fight between Robert Guerrero and David Peralta: it gets three stars. The former world champion in three different weight classes Robert Guerrero entered this fight with a professional boxing record of 33-4-1 (18 knockouts) and he is ranked as the No.14 welterweight in the world but he lost two out of his last three bouts, against Keith Thurman (=Thurman vs Guerrero) and Danny Garcia (=Garcia vs Guerrero). Between these two fights he beat Aaron Martinez (=Guerrero vs Martinez). His opponent, David Emanuel Peralta, has an official record of 25-2-1 (14 knockouts) but he is not ranked as he hasn’t fought since May 23, 2015 when he defeated Guillermo de Jesus Paz. Before this bout he had lost to Cristian Nestor Romero. 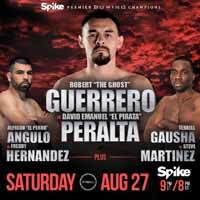 ‘Ghost’ Guerrero vs Peralta is the main event of the evening. Watch the video and rate this fight! Review by AllTheBestFights.com: 2016-01-23, some good exchanges between Danny Garcia and Robert Guerrero but it is not enough to get three stars: it gets two. The undefeated former Wbc light-Ww champion Danny Garcia entered this fight with a perfect boxing record of 31-0-0 (18 knockouts) and he is ranked as the No.7 welterweight in the world (currently the #1 in this division is Manny Pacquiao). He fought twice last year winning over Lamont Peterson (=Garcia vs Peterson) and Paul Malignaggi (=Garcia vs Malignaggi). His opponent, the former world champion in four different weight classes Robert Guerrero, has an official record of 33-3-1 (18 knockouts) and he entered as the No.21 in the same weight class. He also fought twice in 2015 losing to Keith Thurman (=Thurman vs Guerrero) but then he came back to win against Aaron Martinez (=Guerrero vs Martinez). 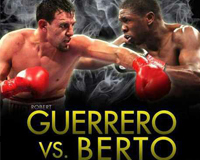 Garcia vs Guerrero is valid for the vacant WBC World welterweight title. Watch the video and rate this fight! Review by AllTheBestFights.com: 2015-06-06, good first part of the fight with some nice toe-to-toe exchanges: Robert Guerrero vs Aaron Martinez gets three stars. The former world champion in four different weight classes Robert Guerrero entered this fight with a boxing record of 32-3-1 (18 knockouts) and he is ranked as the No.12 welterweight in the world while his opponent, Aaron Martinez, has an official record of 19-3-1 (4 knockouts). Both boxers have lost two out of their last three bouts: Guerrero was defeated by Floyd Mayweather Jr (=Mayweather vs Guerrero) and Keith Thurman (=Thurman vs Guerrero), while Martinez lost to Jessie Vargas and Josesito Lopez (=Lopez vs Martinez). Between the two losses Guerrero won over Yoshihiro Kamegai (=Guerrero vs Kamegai) while Martinez beat Alberto Herrera. ‘The Ghost’ Guerrero vs Martinez is the main event of the evening. Watch the video and rate this fight! Review by AllTheBestFights.com: 2015-03-07, good fight with an exciting finish: Keith Thurman vs Robert Guerrero gets three stars. The undefeated Keith Thurman entered this fight with a perfect boxing record of 24-0-0 (21 KOs=87%) and he is ranked as the No.6 welterweight in the world, he fought twice in 2014 beating Julio Diaz (=Thurman vs Diaz) and Leonard Bundu (=Thurman vs Bundu); both figths were valid for the interim Wba Ww title. His opponent, Robert Guerrero, has an official record of 32-2-1 (18 knockouts) and he entered as the No.10 in the same weight class, he has won world belts in four different weight classes (two of which Interim) but he lost his last world-title fight, against #1 Floyd Mayweather Jr in 2013 (=Mayweather vs Guerrero). After this bout ‘The Ghost’ Guerrero fought just once beating Yoshihiro Kamegai in 2014 (=Guerrero vs Kamegai). 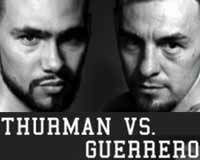 Thurman vs Guerrero is valid for the WBA World welterweight title. Watch the video and rate this fight! 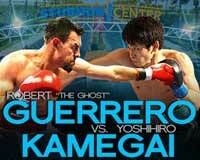 Review: 2014-06-21, good fight thanks to a great performance by both boxers: Robert Guerrero vs Yoshihiro Kamegai gets three stars. Robert Guerrero entered this fight with a pro boxing record of 31-2-1 (18 knockouts) but is not ranked as he hasn’t fought since May 4, 2013 when he was defeated by Floyd Mayweather Jr (=Mayweather vs Guerrero); ‘The Ghost’ Guerrero has won world titles in four different weight classes. His opponent, Yoshihiro Kamegai, has a record of 24-1-1 (21 KOs=87%) and he entered as the No.46 welterweight in the world, he suffered his only defeat in 2013 when he faced the WBA world light-Ww champion Johan Perez; after that bout he has fought and won twice. Guerrero vs Kamegai is the main event of the evening. Watch the video and rate this fight! Review: 2013-05-04, two of the best fighters in the world do not always produce a spectacular fight: Floyd Mayweather vs Robert Guerrero gets two stars. The undefeated Floyd Mayweather Jr (43-0-0, 26 KOs) entered as the No.1 welterweight in the world while Robert Guerrero (31-1-1, 18 KOs) entered as the No.4 (Guerrero’s only loss came in 2005 to Gamaliel Diaz via split decision). Mayweather vs Guerrero is valid for the WBC welterweight title. Watch the video! Review: 2012-11-24, pretty good fight with two knockdowns between Robert Guerrero and Andre Berto but it is not enough to get three stars. Robert Guerrero ranked as the No.4 welterweight in the world, entered the fight with a record of 30-1-1 while Andre Berto had a record of 28-1-0 (Berto is not ranked as he hasn’t fought since September 3, 2011 when he defeated Jan Zaveck). Guerrero vs Berto is valid for the interim WBC welterweight title. Watch the video! Review: 2012-07-28, exciting and tough fight between Robert Guerrero and Selcuk Aydin, it is very close to get four stars. The undefeated Selcuk Aydin ranked as the No.18 welterweight in the world, entered the fight with a record of 23-0-0 while Robert Guerrero had a record of 29-1-1 (Guerrero is not ranked as he hasn’t fought since April 9, 2011 when he defeated Michael Katsidis – four-stars-fight). Guerrero vs Aydin is valid for the interim WBC welterweight title. Watch the video! Review: 2011-04-09, Guerrero vs Katsidis was the best fight of the last week end and one of the best boxing fight of 2011. Robert Guerrero entered the fight with a record of 28-1-1 (his only career loss has been to Gamaliel Diaz in 2005, via split decision) while Michael Katsidis had a record of 27-3-0 (he comes from the defeat against Juan Manuel Marquez, four-stars fight in 2010). Guerrero vs Katsidis is valid for the interim WBA and WBO lightweight titles. Watch the video!